The Fire-fronted Bishop was formally described by Anton Reichenow, a German ornithologist and herpetologist. He was curator of the Humboldt Museum in Berlin and described many birds, as well as some frogs and lizards. 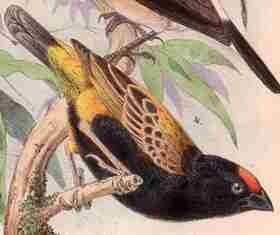 The Fire-fronted Bishop was collected by Gustav A Fischer, a German African explorer. In 1876 he accompanied Clemens Denhardt's expedition to Zanzibar, where he settled as a physician. 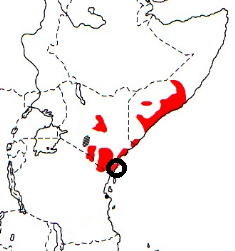 Fischer collected some birds in Zanzibar and then undertook a trip along the Kenyan coast where he collected a male Fire-fronted Bishop. 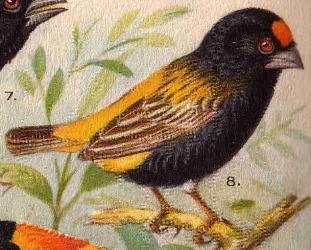 The first illustration of the Fire-fronted Bishop was published in Fischer (1879). The second illustration was published much later, by Delacour (1933), also of a male. The first female was illustrated in Mackworth (1955). Euplectes diadematus	Fischer & Reichenow 1878	Orn. Centralbl., 3, p.88	Malindi, Kenya. diadematus, Latin: diadematus, diademed, adorned with a diadem. A type specimen is in the Berlin Museum (ZMB_23367) and there are some other syntypes.